Have you survived the polar vortex? More importantly, have you survived the first full week back to school/work? I majorly procrastinated on a pro-bono project I was working on over winter break. I also agreed to baby-sit the night before classes started. These two things probably contributed to the fact that on Wednesday night, after only 1 day of class, I had a minor meltdown after looking around at the 3 loads of unfolded laundry, towering stacks of dirty dishes on the counter, and infinite number of pages to be read by the next day. Not to mention the numerous cover letters that need to be written so that I can afford to buy groceries this summer. Is anyone else this behind/overwhelmed/stressed-out already? Thankfully the weekend is a good time to hit the reset button. I'm doing that with lots of sleep, reading, and soup. I first had this soup 3 years ago when my sister made it for a dinner party. It was a cold, January night, and we sat on the floor in her living room and devoured this soup, mopping up the last bits of it with crusty bread. I loved it so much that I made it a few weeks later for Adam and me. He was living in his bachelor pad loft apartment at the time, and he didn't have any furniture yet (except for a 50 inch t.v.-BOYS!) It was a cold, dreary Saturday, but this soup warmed us right up. We ate it, once again, while sitting on the floor. I've thought about this soup often, but I haven't made it since that winter. The potatoes and leeks and butter are just sort of destined to be together here. 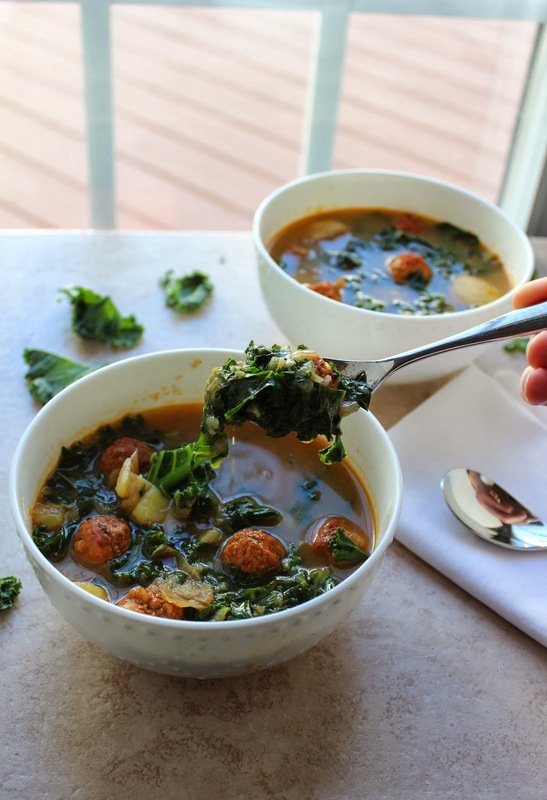 They create a luxurious, flavorful broth that would be delightful all on its own, though the bites of spicy sausage add extra warmth. I lightened the original recipe by using milk instead of cream and turkey sausage instead of pork. 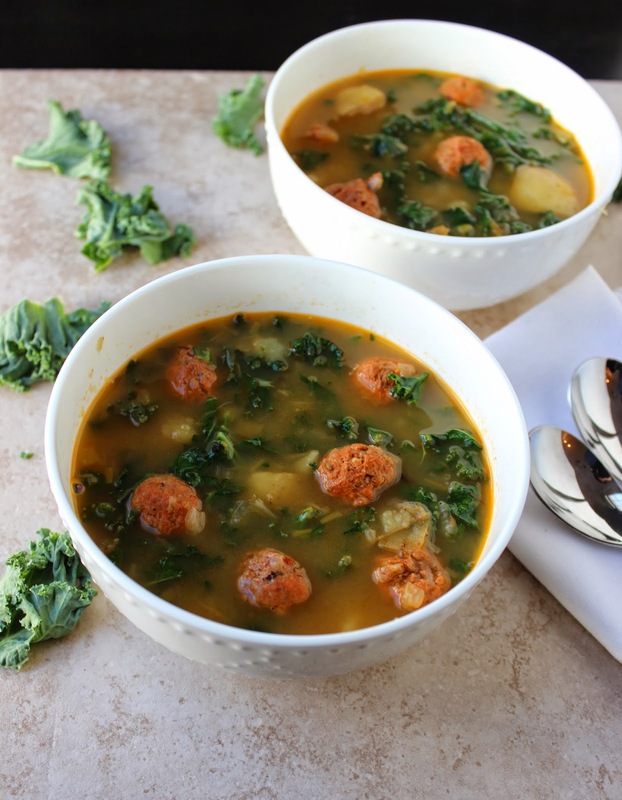 I find that I like the lower fat turkey sausage better since it cooks in the soup broth, but you could also cook the sausage separately and drain it before adding it to the rest of the soup. This is simple, warming, get-your-life-back-on-track soup. Hope you enjoy it, friends. You may have noticed some changes around here. New Year's Resolutions are happening. Also, if you are tech/html savvy, please be my friend/send help immediately. I've also updated the About Me page and made a Stew or a Story facebook page. Like it, if you're into that kind of thing. Melt butter in a large stock pot over medium heat. 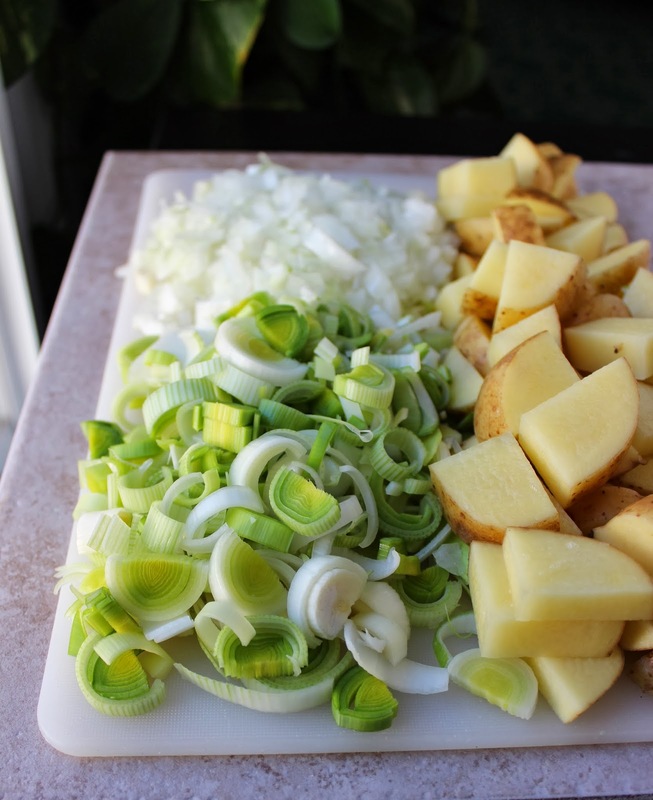 Add onions, leeks, and potatoes. Stir and then cover and cook for 15 minutes. Add nutmeg, red pepper flakes and chicken broth. Bring to a boil. Remove casings from sausage. Use your fingers to roll sausage into mini-meatballs and drop (carefully) into the bubbling broth. Cover and cook for an additional 20-25 minutes or until potatoes can be cut with a fork. Add kale and milk. Cook for an additional 5 minutes until kale is just cooked. Pour steaming soup into bowls and slurp away. Adapted from Bella Eats. Added spices inspired by The Candid Appetite. With the crazy cold weather we had in Toronto, this sounds like a pretty perfect meal! I don't think I can survive the back to school part. Ugh, I hate it with a burning passion :--( Though I think that this soup would make the whole thing miles better. Spicy turkey?? Sounds great, I want it!! That first week back was kind of the worst. But I feel like I'm slowly easing back into things. I could defintiely use as much soup as possible!! This looks super hearty delicious. This looks so delicious, and it's perfect for this time of year!! I hope your first few days back haven't been too bad!